Innovation and Global Issues in Social Sciences 2017 Congress is for people, who want to participate in a major international forum, get published, network with colleagues from many countries and sharing similar or complementary interests, and to have fun in PATARA, the living memory of the first democracy in The World! 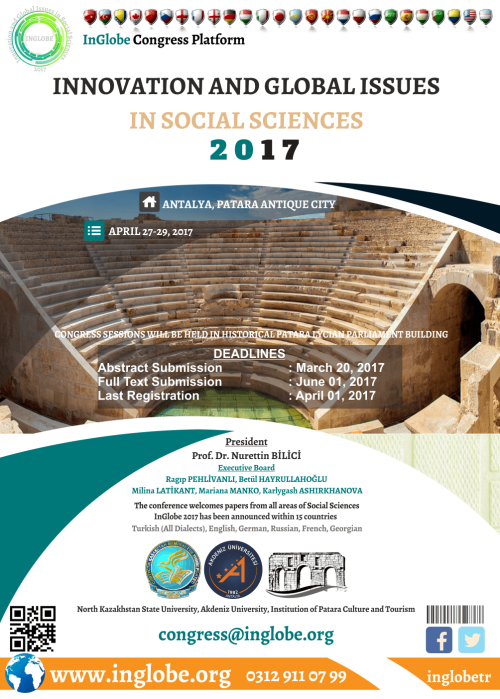 The Congress, organized by free academics platform together with other NGO's and Universities, will be held from April 27-29, 2017 at the Patara Antique City, Antalya. "Innovation and Global Issues in Social Sciences 2017", which is supported by Kaş Governorship, Kaş Municipality, Institution of Patara Culture and Tourism, has been announced within 15 countries. It is aimed to include original works that deal with current affairs, global events, innovative approaches from all fields of social sciences. The presentation languages of the Congress are Turkish and English. It is possible to publish studies in German, Russian, French, Georgian as well as Turkish (All Dialects) and English languages in the context of the Congress. Studies will be published in our Congress books with ISBN numbers. Participants who wish will be able to publish their work in one of The Congress partner journals appropriate to their field of work after the referee's process. Within the scope of the congress, successful studies will be rewarded at every field by science board. INGLOBE 2017 provides the ideal opportunity to bring together academics, researchers, high education students of different disciplines, public practitioners and industry practitioners, discuss new issues, and discover the most recent developments, researches and global trends in social sciences. The conference welcomes papers from academics, including professors and students, public practitioners and industry practitioners. Non presenting participants are also welcome. Due to the nature of the conference with its focus on innovative ideas and developments, papers also related to all areas of social sciences including communication, accounting, finance, public finance, economics, management, business, marketing, education, sociology, psychology, political science, law and other areas of social sciences; also all areas of humanities including anthropology, archaelogy, architecture, art, ethics, folklore studies, history, language studies, literature, methodological studies, music, philosophy, poetry and theater are invited for the international conference.